I learned pretty quickly how life can be unfair. I was a skinny, uncoordinated kid growing up. That meant I was usually near the last to be picked in the dog-eat-dog arena of spontaneous childhood playground sports. There I was, gazing at the two faster, bigger, future pro superstars who held my future in their hands. (Well, the near future anyway… but isn’t that all that mattered back then?) I would just hope that I wasn’t picked last… and I’d breath a sign of relief when there were kids in the talent pool who I had estimated were even worse at sports than I was. Why did I even subject myself to such torture? I wanted so badly to be good at sports… I had a drive to prove myself in this area, even though I didn’t have the ability. You could say the vast difference between where I wanted to be and where I was to be unfair. How is it fair that so many other kids were more genetically blessed than I was? The truth is, life is indeed unfair. It’s an important lesson to learn. But to say it’s unfair is not really correct. It attributes a personality to circumstances, as if “life” is out to get us. It’s us playing the victim. What we call “unfair” is really just an inevitable byproduct of the fact that we all were born with different talents, interests, and capabilities. I didn’t learn until much later that I could make the unfair principle work for me… not in sports, but in art. Because I was far better at drawing and painting than anybody else in my class. While the sports superstars of the third grade had found their talent years earlier, I had finally found my unfair advantage. 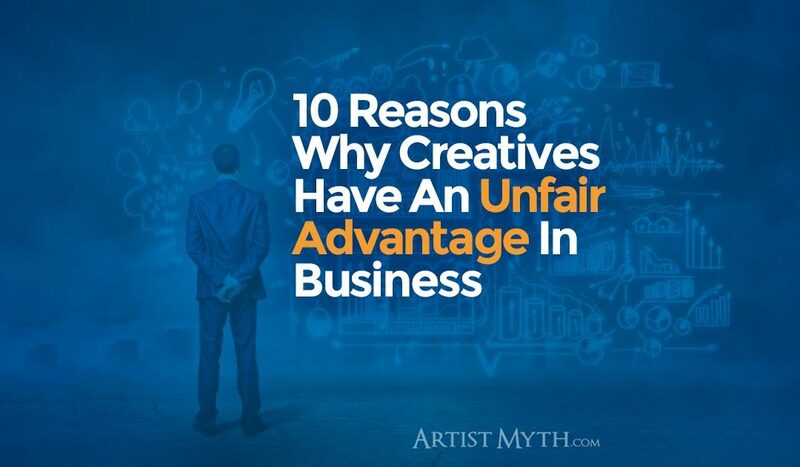 Creative people have the unfair advantage in today’s business world. The high-speed world of commerce today rewards innovation at the speed of thought. Not just any innovation, but thoughtful, bite-sized ideas that are immediately tested and refined. It also rewards sensitivity, empathy, and spontaneous sharing. It disfavors glacial business models and favors hybrid approaches that put people first. The age of two-year long development cycles before a product even sees the light of day is over. Now we have focus group testing, lean principles, and preorders. 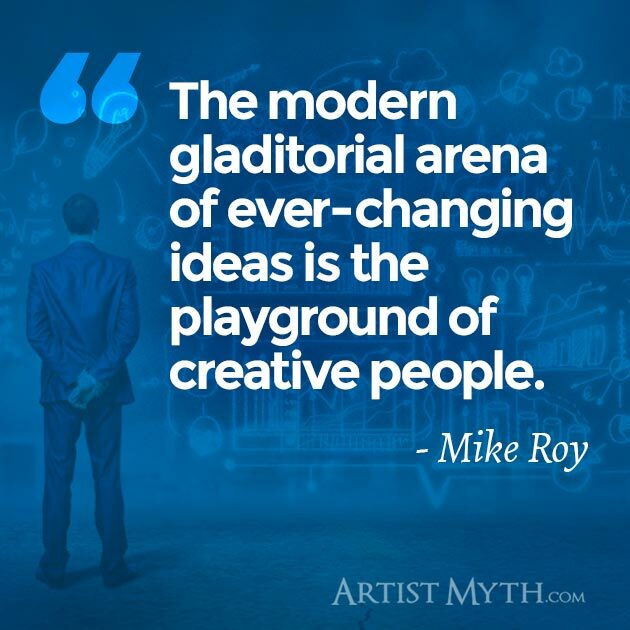 This modern gladiatorial arena of ever-changing ideas is the playground of creative people. In this arena of ideas and commerce (which I imagine, of course, looks a lot like the disc battle scene in the movie Tron) we see bright flashes of genius. We see a hybrid creature who is both an artist and a businessperson. He or she is just as comfortable in a corporate meeting room as they are in an art studio. They wield either pen or paintbrush with equal skill. This person is a creative entrepreneur. In his book Rise Of The Creative Class, author and economic researcher Richard Florida writes about these highly effective human beings, which he says make up about 30% of today’s workforce. More and more businesses understand that ethos and are making the adaptations necessary to attract and retain creative class employees—everything from relaxed dress codes, flexible schedules, and new work rules in the office to hiring recruiters who throw Frisbees. Most civic leaders, however, have failed to understand that what is true for corporations is also true for cities and regions: Places that succeed in attracting and retaining creative class people prosper; those that fail don’t. What’s Different About Creative People? Creative people’s minds are just wired a bit differently. It didn’t make us very good (“good” = “obedient” and “unquestioning”) factory workers during the last century, but now we’re finding our place in the world of commerce. They used to say we couldn’t be worked with. They used to say we didn’t play well with others. They chided us for that very annoying habit of gazing out of the window for a very long time. But for those of us who are awakening to the possibilities now available, the old assumptions are fading away. We’re no longer content with our place at the kid’s table. We are redefining what it means to be a creative person. For those of us who are traditional fine artists, we’re finding that the old “gatekeepers” have less power because we now have direct access to our audience. With some catch-up training in marketing and selling, we’re finding tremendous success, even wealth. Those of us who are creative entrepreneurs are now finding willing listeners to our ideas. And for those ideas large enough to require considerable sums of money, we are even finding funds being offered and partnerships extended. Don’t get me wrong… nothing is ever easy, and it never will be. But for those of us who call ourselves artists, if we’re willing to put in some hard work and to learn some additional skills that will help us in the business world, we will find ourselves at an advantage. And in the information age we find ourselves in, the creative entrepreneur’s killer combo of art skill with business savvy can quickly become their unfair advantage. What do I mean by unfair advantage? I imagine what the opponents of Wayne Gretzky, arguably the best hockey player to have ever lived, must have thought as they tried to play against him. It’s with that frame of mind that I want to talk about the characteristics of these hybrid creatures, these creative entrepreneurs who are able to mix art and business. My hope is that if you are a creative person, it will embolden you to take whatever steps you need to get to the next level in your creative business. I aim to help you realize that you’re not really as far away from success as you thought you were. And to give the “creative you” the self respect it deserves. Unfair Advantage #1: Creative People’s Minds Are Always At Work. The creative mind works overtime to process information, assess the big picture of a situation, and synthesize different ideas. This happens subconsciously and so it’s happening all the time: while on a walk, while driving, while in the shower, even while sleeping. For the creative person, this is totally natural, and so it doesn’t feel like work. In fact, it often feels a lot more like play. It should be mentioned though – that for some creative people (or for some creative projects) it’s quite the opposite, more like a pitched battle or a painful surgery. 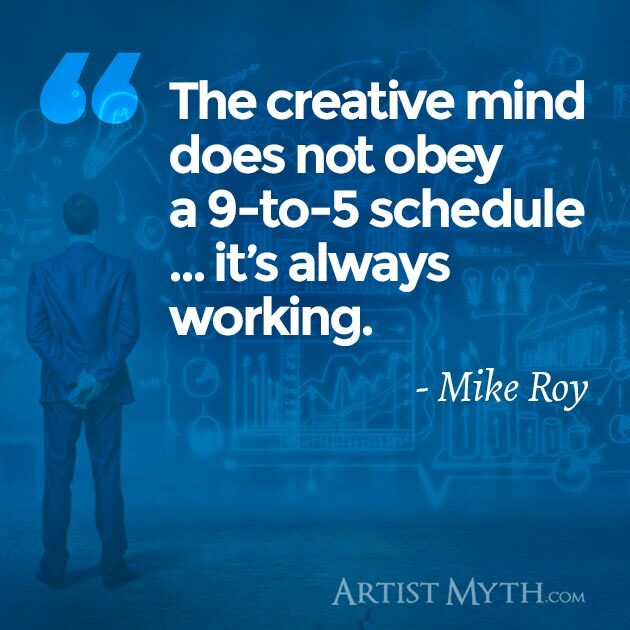 Either way, the creative mind does not obey a “9 to 5” schedule – it’s always working. And who can compete with the brain that works while sleeping? Unfair Advantage #2: Creative People Make Value Out Of Thin Air. If more creative people realized something about themselves that their bosses already know, they’d ask for a lot more money. That thing is this: creatives are the closest thing to the fabled Golden Goose there is. Even with modest resources and time, a creative worker can produce many times more value than the original investment. Whether it’s a digital product such as a training course, or intellectual property such as a story or song, creative products yield a tremendous return on investment (ROI) when used properly. I once visited the British Museum in London. Amidst the vast collection of artifacts from every age and location on earth, something in a quiet little corner of the museum affected me more than any other. There in a glass case lay a rumpled piece of paper with hasty words scrawled on it. Some lines of text were crossed out and others squeezed in haphazardly. There was nothing artistically relevant or inherently valuable about the piece of paper itself. Its immense value was in the idea the words represented. The idea conveyed by these scribbled symbols was a song – and that song was Yesterday by the Beatles. The creative brain is a marvel, isn’t it? Money may not grow on trees, but it can definitely be cultivated in an artist’s gray matter. Unfair Advantage #3: Creative People Are Expert Curators. In our information rich society, the creative’s ability to synthesize different bits of data into a relevant (and attractive) whole that can be consumed is an increasingly prized skill to have. This is called curation. When we curate, artists and creatives do more then just collect bits of random stuff and mash them together… we combine them in a highly purposeful way. The resulting collage is something that is much more than the sum of its individual parts. The way they are combined in itself becomes an artistic statement. Creatives curate through a set of highly developed filters. These internal filters collate and sort information using our acute sense of style and experience. This happens constantly. You know when it looks like we’re staring off into space, appearing to “zone out?” We’re usually processing information and sorting it through our filters. This filter becomes one of the artist’s greatest business assets. People will pay a premium to experienced artists who can make creative decisions based on their finely honed artistic filters. It’s more than just being able to pick the right font pairings for a print piece or choosing the right color scheme for an interior design. It’s being able to carry an authority as a creative decision maker that people respect. Unfair Advantage #4: Creative People Are Highly Self-Motivated. We artists normally enjoy making things. As employees, as long as we’re given clear direction and enough autonomy to work, as well as the necessary tools that we need to do our job, we are highly effective and require minimum direction. This makes us extremely valuable to any company. Being highly self-motivated can also yield an insane amount of productivity. When we combine our twin superpowers of motivation and creative inspiration, watch out! We achieve a “flow state” where time stands still and it’s just us and our art. Brushes whisk around merrily on canvas and fingers fly happily on the keyboard as pages, canvases, notebooks, sketchbooks, and walls become filled with creative product. Unfair Advantage #5: Creative People Are Natural Marketers. Marketing is a frequently misunderstood field. Many people think it’s all about hype and overselling. But just because some marketing-types act this way, it doesn’t mean all marketing (or truly effective marketing) is this way. The core effectiveness of good marketing is simply communication. It’s telling the story of a brand in an attractive way that (ideally) is authentic enough to portray it’s values accurately. This matches customers with companies in a harmonious relationship. Creative people are naturals at this … who can tell a story better than a novelist? Who can make a logo better than a graphic designer? Who can shoot and edit a sales video better than a filmmaker? For this reason, many creatives do find a rewarding career in a marketing field. For self-employed artists, often all it takes to vault their tiny business to greater success is a bit of practical training on how to market themselves, as well as a dedicated focus on spending more time on marketing activities. Artists are also attention magnets. They know how to rouse interest and maintain a customers attention. One particular area of marketing where creatives shine is Content Marketing. Content marketing is a byword today, but it likely started way back in 1895 when John Deere launched a magazine called The Furrow, which provided information to farmers. (This magazine is still in circulation today!) In the 1930’s soap companies started sponsoring daytime dramas on radio (and later television), which became known as soap operas. With a firm understanding of a company’s brand and clear goals, a creative person can be unleashed to create a magnetic content marketing campaign that can win a great deal of customers and prospects. Content marketing is a rampant strategy today, and can require a considerable team of creatives to make it happen. Unfair Advantage #6: Creative People Are Relentless Problem Solvers. If a creative worker is asked, “how can we make this better?” They will probably become excited at the challenge and go to work on it. The proposed solution may not be what you expect, and it may even result in some ridiculous ideas that you’ll want to quickly dismiss. But somewhere in there is a workable and unique approach that you may have never have thought of. To outsiders our methods may seem confusing and haphazard – but stick around long enough, and you’ll find those seemingly disjointed ideas coalesce into solid ideas with possibility. Unfair Advantage #7: Creative People Are Fun And / Or Interesting To Be Around. Creatives may not be extroverted party animals, but we’re certainly interesting to be around. We seem to have a photographic memory for all things offbeat and wacky. We can carry a discussion about philosophy in one sentence and obscure pop-culture the next. We listen to cool music and decorate our workspaces with fun things. We strive for the unpredictable, the new and original. We are colorful characters and we bring flavor to any atmosphere. Unfair Advantage #8: Creative People Understand Culture. 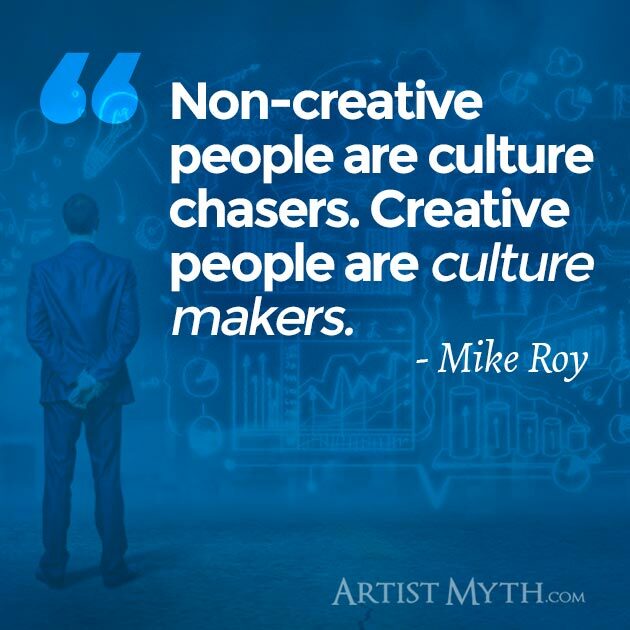 Non-creative people are culture chasers. Creative people are culture makers. We understand people and think deeply about what makes them tick. We “get” offbeat humor. With our empathy we can imagine what people will feel like. We understand symbolism and can create products that are rich with significance and meaning for any audience. While we get and understand culture, we are also processing it and then influencing culture with what we make and share. Why is this important? Because one of the cornerstone principles of business is understanding your target market. Creatives can give you an insightful understanding of the groups of people that make up that target market. Not only that, but they can formulate the proper message to that market. Unfair Advantage #9: Creative People Have Vision. Vision, in the entrepreneurial sense, is the ability to form a mental image of something that hasn’t happened or been created yet. This “image” is not necessarily just a visual picture – it can also be a song, result, condition, organization, or event. It can be a concrete thing or an abstract concept. Creative people use our imaginations to do this, but we may also employ things like sketches or models of that visualized result to help flesh it out and share it. A vision can be sharply defined with a lot of detail. But it can also be very malleable, able to be shaped as needed, like a piece of wet clay. As you can imagine, this ability comes in very handy when venturing into new markets, developing untested products, or any other foray into unknown business territory. Creatives with extensive experience and the ability to communicate their vision become thought leaders. These thought leaders are highly sought after for their opinions, and they have considerable influence over companies and cultures. Unfair Advantage #10: Creative People Make Stuff Look Good. Put simply, we just know how to make stuff look, sound, and feel “right”. We do this naturally, and as we develop our aesthetic skills, we get better and better at it. It may seem like it comes to us without thinking, and much of it does. But there’s an actual process at work too. There’s a science about why color schemes look “right” for a particular application, and a universal law of proportion for how things visually look in relation to each other. There are formulas for what musical notes harmonize together. We train to learn these things and they come to the forefront in our creative process when we need them. We also know how to use the tools that help us with our craft. And as these tools are ever-changing, we know all about the process of learning how to use and adapt these new tools to give us a competitive edge. Are You A Creative Person? Press Your Advantage! Have you been undervaluing yourself in your marketplace? 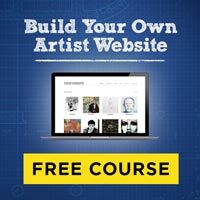 Have you been holding back from starting a creative business for fear of the unknown? Have you been hesitant to assert yourself in your job, feeling that your role as a creative somehow puts you in a lower class? Do you feel that a lack of skills in noncreative areas are putting you at a disadvantage? Depending on your answers to the above questions, you may consider making some changes in the way you think about what you have to offer a company or marketplace. Because as creatives, we offer quite a lot. In fact, our skills and talents provide people with valuable, even priceless creative assets. These very important assets (also known as intellectual property) can form the bedrock of a thriving business or a thriving culture. Creative People’s Minds Are Always At Work. Creative People Make Value Out Of Thin Air. Creative People Are Expert Curators. Creative People Are Highly Self-Motivated. Creative People Are Natural Marketers. Creative People Are Relentless Problem Solvers. Creative People Are Fun And / Or Interesting To Be Around. Creative People Make Stuff Look Good. Think about each of those advantages in turn. Which ones resonate the most with you? How has one of your creative advantages put you ahead of the pack or gotten you extra attention? Do you consider yourself a creative entrepreneur? What other beneficial skills (communication, management, technical, etc.) can you add to your creative ones to make you an unstoppable entrepreneurial force? Are there any “unfair advantages” that I may have missed? As a creative problem solver and thought leader, you have something special and unique that stands out in the world. Don’t forget to use it to your advantage! Good article. It makes me even happier to identify as a creative person. Thanks, Wendy! I’m glad you took a positive message from my post. That was my intention, that we creatives feel good about what we can offer the marketplace. So much of the time we’re so critical of our work (and ourselves) that we miss the big picture. Thank you for commenting and sharing your thoughts! Nice and inspiring article Mike. As an artist, I thought about myself as a good creator rather than a good marketer. I can do everything in the field of art widely and love to spend more time in my studio, but the professional marketing is a separate thing. Although it’s a kind of art and it is necessary for the comparison to the modern era. I even know, some artists who are very good marketer consequently. I appreciate it, but if you normally think of an artist as a professional marketer, should it appropriate 🙂 ? The primary goal of the artist is, of course, to conceive of and make art. But sharing it is also very important! While marketing isn’t normally the primary function or focus, we creatives do make natural marketers. My point is that we realize this advantage and use it to our benefit, as well as the benefit of others. Thanks, Amar, for your comments! I love this! I am a creative and a coach of creatives. Still, I find myself at times frustrated with the part of me that you explain here. “The creative mind works overtime to process information, assess the big picture of a situation, and synthesize different ideas. This happens subconsciously and so it’s happening all the time: while on a walk, while driving, while in the shower, even while sleeping.” Ha ha! No rest for the creative. Relatively new to the entrepreneur world of an online business you have encouraged me to engage my creative fully and to use it to my advantage. Thank you so much! Thanks, Deb! I really like your site, and how you can help people write a theme song of their life. Pretty cool stuff! Yes, the hyperactivity of the creative mind definitely cuts both ways. I’m experiencing that as a dad of a very creative young lady, whose mind is always working overtime. She often requires some coaching from time to time when it’s time to “turn off”! The creative mind is kind of like a wild animal in that way, requiring a disciplined effort to tame it. I’m glad the article helped you, and I wish you well in your own creative endeavors.